Purple is no newbie to wedding colors. (But it did get a revamp when Pantone named Orchid the color of the year!) Its a mature, romantic color that still brings a pop to your big day. If you’re planning a wedding, especially a Spring or Summer ceremony, consider using purple as your theme. Its a lovely way to bring freshness to the decor! And be sure to customize purple bachelorette party shirts! Step 2: Take an empty toilet tissue roll and set it up right in a clean bowl. Spoon mixture into the cardboard toilet paper roll (or consider using an empty deodorant container). Place tube, in the bowl, in the freezer overnight. Step 3: To use, peel away just the top 1/4 inch of the cardboard roll and smooth the frozen stick over your face (think of it as a push up pop). Leave your mask on for 5 to 10 minutes, then rinse off with warm water. Return the cream stick covered with plastic wrap to freezer between uses. Particularly soothing on a sunburn. Keeps indefinitely. Mix all ingredients together and smooth onto face. Relax for 10 minutes, then wash off with warm water. This recipe makes a pore cleaning “strip” which works just like those sold in popular drugstores. Mix two ingredients and microwave for 10 seconds to slightly warm. Using a clean cosmetic brush, apply to nose and chin area. Avoid delicate eye area. Rinse brush immediately. Allow mixture on nose and chin to dry for 10-15 minutes. Mixture will dry quite stiff and form a “stiff film.” Peel off the film and stare at all the little porcupine quills that used to be in your nose pores (one of the chief entertainment factors with B’Strips!). As the end of the summer season approaches, many of us are sporting that attractive tell-tale sign of fun in the sun: Peeling skin. Spa Index has an excellent recipe for an Almond Body Scrub to gently and thoroughly exfoliate the top layer of dead skin cells. Body scrubs feel wonderful and relieve the itch of flaking skin. Combine the dry ingredients in a blender or food processor until they are reduced to a coarse meal. Keep this “scrub base” in a glass jar with a screw top in your refrigerator until ready to use. When you want to use the scrub base, scoop out 1/4 cup into a small bowl, and stir in enough of the liquid ingredients (vary it by what you have on hand — yogurt and milk are best, but water works) to make a paste. Yogurt and milk are natural exfoliates known as alpha hydroxy acids, and they will slough off dead skin cells even without the scrub. Scoop up the paste with your hands or a washcloth, and rub over your body to exfoliate peeling skin. Rinse thoroughly. The next time you decide to spend the day at the beach, take advantage of the “on location foot treatment.” Brazilians are known for scrubbing their entire bodies, particularly the feet, deep into the sand while they relax on the beach. When going to the beach, take a small vial of ingredients with you: 2 tablespoons of canola oil (or use your suntan oil! ), and, a small vial of rosemary oil — or premix and take one vial. Once at the beach, use an empty container (a soda cup is fine) to mix the ingredients together. Mix into a paste. Massage sand scrub onto feet (and elbows), concentrating especially on problem areas. Rinse off in the foamy waves, pat dry with your beach towel. Use this mixed concoction immediately after making it, for soft and silky skin. Beat together egg, olive oil, glycerin and milk powder with a whisk or hand held beater. While beating add essential oils. Continue beating until a smooth paste forms. Add the water a little at a time, continuing to beat. Immediately add to your warm drawn bath (be careful…if the water is too hot you’ll make scrambled eggs). Saturate one denture tablet with a few drops of essential oil of your choice. Drop the tablet into a small bowl of warm water. Soak fingertips 10 minutes. Do not keep mixture. Discard after use. Process almonds in a blender or coffee grinder until finely ground. Set aside. In the same blender, pulse your oatmeal until of the same consistency. In a bowl, combine ground oatmeal, cocoa butter, honey and ground almonds. Rub into your clean feet, step into cotton socks, and leave on overnight. The next morning, remove the socks and rinse feet in cool water. Pat dry. We recommend you not remove the socks until you’re standing in the tub! Who would have thought that paper bags could be so beautiful? Martha Stewart that’s who and she is totally right! Vases of varying sizes, shapes, and materials can be unified with mere paper bags to serve as fresh, bright centerpieces at a casual wedding. 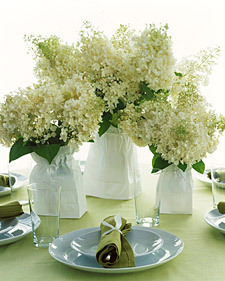 Slip the plain white lunch bags over the containers and cinch the tops loosely with ribbons tied in bows. This centerpiece idea is perfect for a garden themed wedding or a beautiful bridal luncheon. You’ve decided to have an outdoor wedding? Congratulations. Outdoor weddings are romantic and beautiful. However, they aren’t as easy as they may look. Outdoor weddings come with additional caveats and pitfalls, but if you follow these tips, you’ll be sure to shine on your wedding day. 1. Make your guests comfortable Think about what the weather will likely be at the time of day and month of the year of your outdoor wedding. Sunny and hot? Don’t leave your guests uncomfortably melting – have your ushers give guests ice-cold bottles of water as they are seated. Consider printing your wedding program on a fan so that guests may cool themselves. Don’t forget to have plenty of sunscreen on hand as well. For a very warm location, look into renting large electric fans (don’t forget a generator) and/or a tent to shade the suns rays. If it will be cold and damp, make sure you tell guests that so they can wear extra layers. A simple xeroxed insert will do. You might want to have lap blankets on hand, or rent portable heaters. 2. Have a backup plan What will you do if it rains? The ideal outdoor wedding location has an indoor location waiting just in case. Many brides and grooms opt to have their ceremony outside and reception inside. In a pinch, the tables can be scooted to the back of the room during the ceremony. A tent is another option, but only for light to moderate rain storms. A heavy rain will soak the ground underneath, leaving guests with soggy and muddy shoes. Make sure any tent you rent is sturdy so it won’t flip over, and that it has thick and weighted sides. 3. Plan for Wind Many outdoor weddings suffer from windy conditions. Avoid light fabrics like chiffons and china silks in your dress and the bridesmaid dresses. Tell your hairstylist that you’ll be having an outdoor wedding so she/he can plan a style that won’t leave you looking like Cousin It! Men in the wedding party should use pomade or other styling product. Again, tell your guests in a printed insert so that they can plan accordingly. And of course, make sure your tent will stand up to gusting winds or find an indoor backup plan. 4. Can everybody hear? When you picture your dream wedding at the beach, you’re probably not hearing the roaring of the waves, the rushing wind, or the local kids running and screaming around you. Look into renting a sound system with clip mikes for the bride, groom and officiant. Your DJ or band may be able to easily arrange this for you. 5. Decorations One of the bonuses of an outdoor wedding is the natural beauty around you, lessening your need to decorate. But you still need to do some work. Visit the site a week before your wedding to make sure the grass is mown, the ground raked, and the flowers have bloomed. If your wedding is at a public park, you may want to ask the groomsmen or friends to do this the morning of your ceremony. If it’s been an especially cold season, you may need to supplement the flowers with some potted bulbs from a florist. Other decorations you may want to consider include an arch or trellis to focus the ceremony and frame the bride and groom as they say their vows; strings of lights or lanterns in the trees; luminaries; torches; or farolitas. 6. Make things tasty outside Does your caterer have experience planning an outdoor wedding menu? Make sure they’re planning things that will keep well outdoors in the heat. Avoid things like mayonnaise salads or dishes which must be served cold. 7.Don’t leave your guests parched Since alcohol is dehydrating, consider serving a variety of lemonades, teas and punches. Be sure to have plenty of ice and water around as well. For a fancy cocktail, why not serve a classic mint julep or a mojito? The mint will refresh and cool your guests. 8.Those pesky flying things Be sure to put out citronella candles or a bug zapper so that your guests won’t spend the whole ceremony swatting at the air. 9.Here comes the sun Consider timing your outdoor wedding for sunset where your guests will see you take your vows surrounded by the warm glow of the sun. Those having a daytime outdoor wedding should orient the ceremony so that the sun will be on guests’ backs rather than in their eyes. 10.Permits Don’t forget to contact your city parks department or other local government to get a permit for an outdoor wedding. Be sure to ask about rules concerning trash removal, candle or torch lighting, and pre-wedding photography. Our French Terry Lounge Jacket and Pant is the perfect wedding day combo. It is the most comfortable set that we have ever had on the site! This set is wonderful for all of your pre-wedding preparations. Get one for all of your girls to wear before the wedding. The zip-up hoodie allows you to change into your gown without messing up your beautiful hair! The front left chest and the back of the jacket are completely customizable with your one of a kind saying. You are also able to add a design to the front and back of the pant as well. This gives you many options for sayings and designs. Who would have thought that buttons could have such an elegant impact? These designs from Martha Stewart.Com are simply adorable. I love the place card idea. This would be a great look for this years popular color theme—silver! The sucker stands add a touch of whimsy and would look wonderful as a centerpiece for the children’s table or part of a candy buffet. I also love, love, love the favor boxes. It is a unique idea that is so beautiful! Who would want to leave these pretty favors behind? To see more ideas of how you can incorporate buttons into your wedding and learn how to make the ideas pictured above, click here! Are you or your fiancé huge sports fans? If so, incorporate this interest into the wedding. 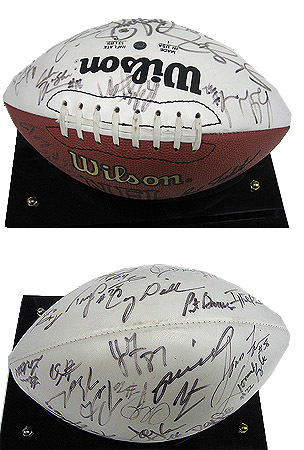 Instead of a traditional guest book, have your guests sign a football, a hockey stick, or maybe even a home plate. Be creative and find something that is perfect to reflect your love for the sport. Your fiancé is sure to love this unique alternative! After the wedding, you can get a case to display your wonderful memento for years to come. Keeping children entertained at a wedding reception can be a hard task. Especially if you have many that are toddlers. However, there are many ways to let them have a ton of fun and still keep the elegance of your wedding. Rent a table that is just their size and decorate it with the same linens as the adult tables. Instead of a traditional flower centerpiece, give them a centerpiece that they will truly enjoy. Try an edible fruit bouquet that will tame little tummies throughout the night. A fish in a fish bowel is another unique option. Children love watching those little guys swim around and will have tons of fun. Never underestimate the power of crayons! Put crayons in a colorful container that matches the theme of your wedding and lay out sheets of printer paper for children to create their on piece of artwork. You can even make your own wedding themed coloring book for them to decorate. I would strictly stick with crayons however, because markers, paints, and oil pastels may get on their nice clothes. Play Dough is a favorite of children everywhere—and some adults too. This is a cheap and easy way to keep them entertained. Add some toy cars, kitchen utensils, toy animals or anything else that would make neat prints in the dough. You can usually find these items at your local dollar store. There are tons of dough recipes out there that you can choose from that will tie in with the theme of your wedding. You can even have the children make you a sculpture out of the dough to keep and remember them by. Just be sure to check that they will keep for a few hours and not have to be refrigerated. Here are a few to get you started. This dough is not for eating! Mix together the cinnamon, cloves and nutmeg. Add the applesauce and glue. Work the mixture with hands until smooth and well mixed. Put on wire rack to dry at room temperature for several days. Mix together the flour, Tempera and oil. Add enough water to make a soft, pliable, elastic-like dough. This dough does not keep well. Beat egg white until stiff. Add remaining ingredients, one at a time, in order. Mix well and let dry for 30 minutes. Divide into portions, and add desired food colorings. NOTE: Use pasteurized egg whites or reconstituted dry egg white. In a medium-size saucepan, mix all ingredients. Cook over medium heat, stirring constantly. When dough becomes harder to stir and gathers on spoon (about 5 minutes), dump onto wax paper, cool until able to handle and knead 10 to 15 times until smooth. Store in sealed container, keeps up to two weeks. Mix all ingredients together. Make shapes, then eat. This dough can be refrigerated in a plastic bag or bowl. Mix the flour and salt in a large bowl. Slowly add water a vineagar and stir with a wooden spoon until the mixture is stiff. Knead until pliable. Divide the dough into separate pieces for each color desired. Poke your finger into the center of each section of dough, drop in the food color and peppermint extract, and knead until the color is uniform and the dough is smooth. Store, tightly covered and labeled, in a plastic bag or container in the refrigerator. Play Dough will keep for months if you refrigerate it after each use. Take out of the refrigerator about 5 minutes before you’re ready to play so that the dough will be soft. If you like something you have created, you can leave it to air dry for 24 hours or help it along by placing in a warm oven at 200 degrees F for several hours. It should harden enough to paint, shellac, or spray with art fixative. Pumpkin Pie Playdough recipeThis smells great, so remind small children that it is not for eating. Mix all of the ingredients together. Cook and stir over medium heat until all lumps disappear. Knead the dough on a floured surface until it is smooth. Store in an airtight container. Mix ingredients and cook over medium heat. Remove from heat when thick and rubbery. As mixture cools, knead in enough flour to make a workable dough. Bubbles give children hours of fun. Get a bubble blowing machine and let the bubbles fly! The children will be dancing in them for hours. It will also add a beautiful scene to the reception. Bubbles look beautiful in pictures. Another option is to give each child their own bottle of bubbles. You can even make bubbles yourself and put them in containers that will correspond to your wedding colors. Mix all ingredients and let bubbles settle. Crazy Bubbles recipePut 1 quart of water in a shallow tub. Stir in 1/2 cup sugar until it dissolves. Add 1/2 cup dishwashing liquid and stir again. Have kids dip in a slotted kitchen spoon or fly swatter, and swing it in the air.You can also cut both ends out of an empty frozen juice can. Dip one end in the bubbles and blow through the other. Makes huge bubbles! Contact the parents of each child and find out what their favorite book is. You can then buy these books and give them to the children as their wedding favor. You could also rent them from your local library for free and return them later. Libraries usually allow you to keep books for about a month, so there will be no rush to return them. If the children do not have a favorite, get books that are popular children’s books. Brown Bear, Brown Bear by Eric Carl is always a favorite from younger children but there are many out there. Your local librarian can help you find the perfect book for the age of the children attending your wedding. Have a portable DVD player on the kids table and a few children’s DVD’s to choose from. Assign an adult to watch after the movies and change the movie for the children. The kids can then sit and watch their favorite movies. If you have a DJ, have them play a few songs that the children will love. If you know, their favorite songs have them play those. If not, pick a few fun kid songs. Most adults will enjoy these songs as well! Children love to build things and blocks, Lincoln logs, and Lego’s do just that. Keep in mind that these will get a little loud if they go tumbling over; which they are sure to do. However, if will give the children hours of entertainment. Allow the children to have center stage! Play a song and only let the children dance. They will love this time that is strictly for them. Pick a fun upbeat song that is familiar to them and watch them boogie. It will make for some really cute pictures as well! This product is for all of you cowgirls out there. This personalized cowboy hat is the newest addition to our hat collection! The pre-curved brim, distressed finish and metal eyelets update this hat giving it a worn, broken in look. Customize the band to make it unique! This would be the perfect accessory for our Save a Horse Ride a Bride shirt! Brides are always looking for unique takes on the traditional guest book. Often the traditional guest book ends up in the back of a cabinet or closet and is never seen again. Brides now want something unique that can have a purpose afterwards. That is why I love this idea of a guest painting. Shawn and Owen had their guest contribute to painting as their guest book alternative. Shawn and Owen assigned their friend Kathleen as the “art director”. Kathleen sketched an image of a sunflower on the canvas and divided it into squares. 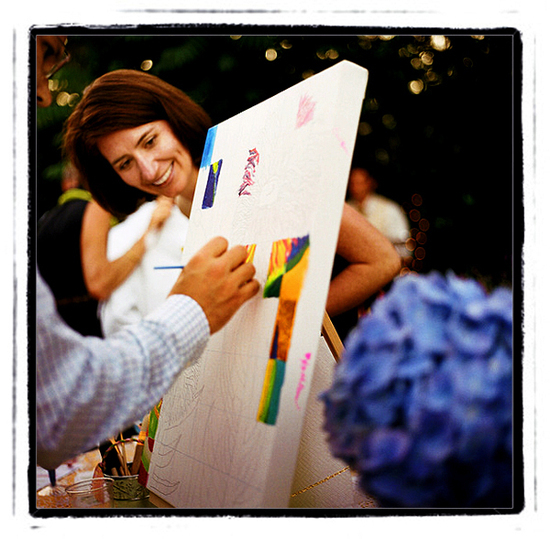 At the wedding, each guest was to paint one square on the grid. The couple set up a table full of paints and directions that explained the project in detail. 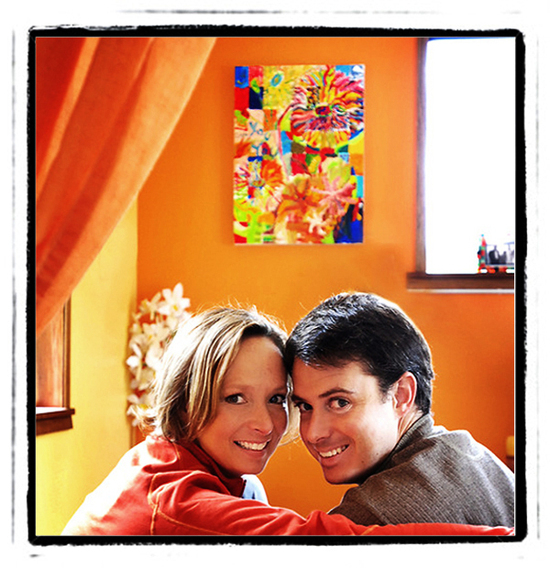 Afterwards the couple had a wonderful piece of artwork that went wonderfully in their new home. Check out One Love Photo for more information and another wonderful creation!